Cooking hard boiled eggs is easy and quick, especially if you are making them in your electric pressure cooker. But how to make perfect Instant Pot Hard Boiled Eggs that peel easily? Check out my easy method below. 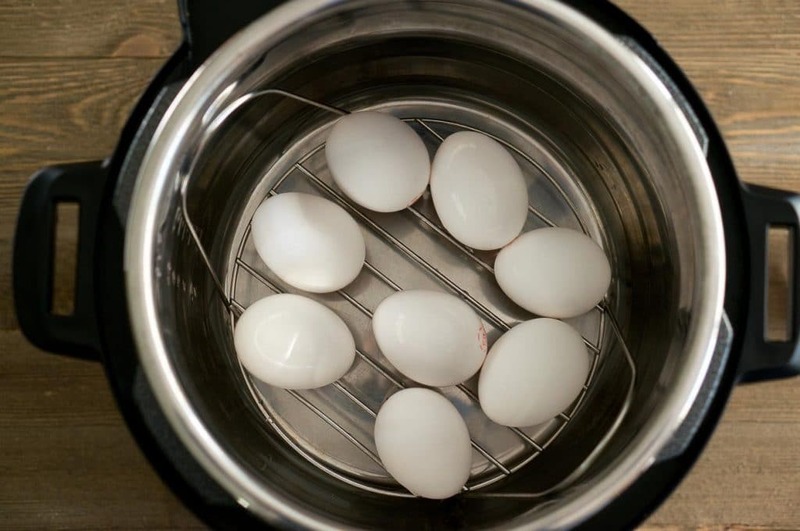 I love making hard boiled eggs in the [easyazon_link identifier=”B00FLYWNYQ” locale=”US” tag=”delimeethea05-20″]Instant Pot[/easyazon_link] because it requires less fiddling around with pots, hot water, and the hot stove top. You pretty much set it and forget it. It is also very convenient when you are making a large batch of hard boiled eggs. I cooked 8 eggs in my Instant Pot and I could have added 2 more easily. And cool the eggs in ice cold water for 5 minutes. They come out perfect every time. And peeling is a breeze. 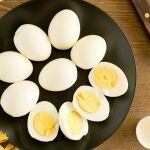 Using this technique for Instant Pot hard boiled eggs guarantees that the eggs peel easily and the egg yolk is a nice yellow color with no gray or green circle around them. This gray circle usually appears when the eggs have been boiling for too long. 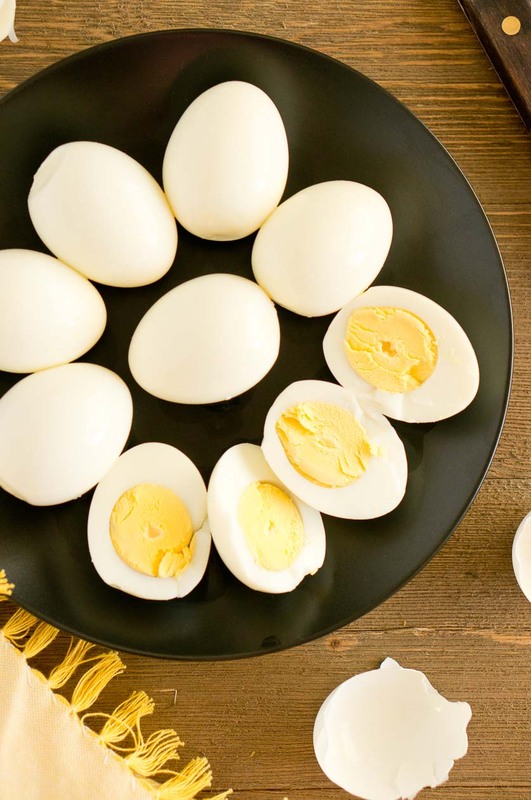 You can store hard boiled eggs (still in shell) for about a week in the refrigerator. 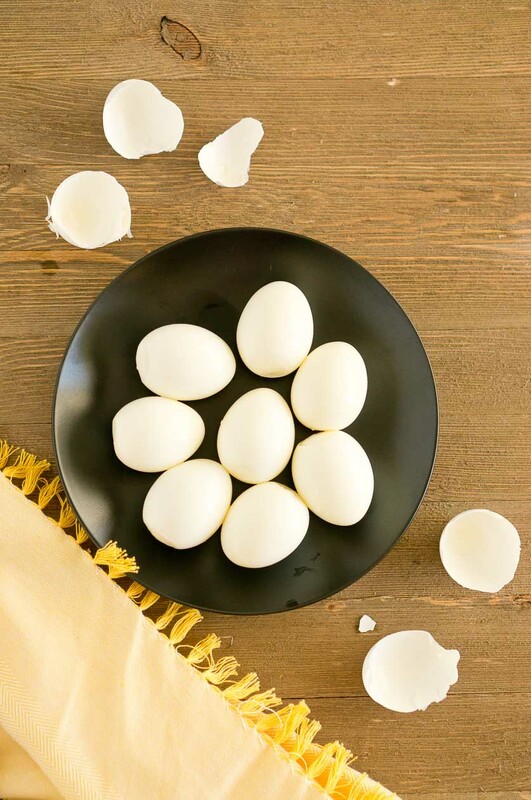 If the hard boiled eggs are already peeled, use them the same day for best quality. I like to make a dozen hard boiled eggs on the weekend and then use them for breakfast or add them to my lunch during the week. It’s so easy, convenient and healthy. Eggs are good for you – so nutritional and a great source of high-quality protein. 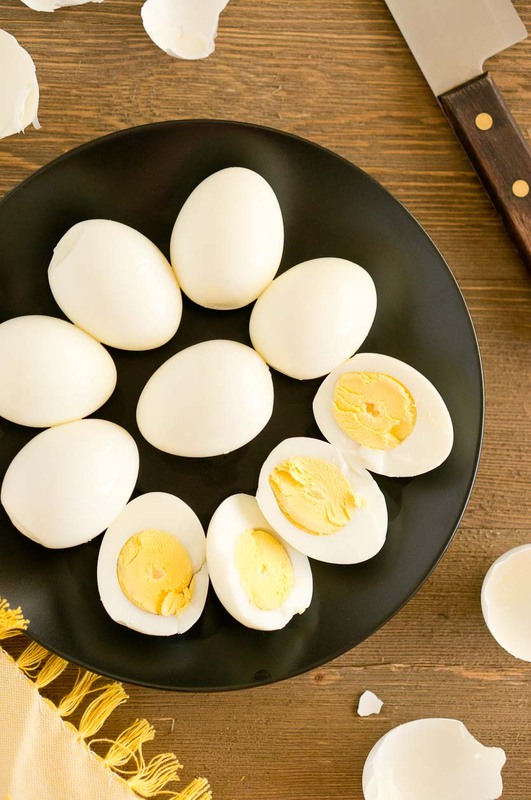 These easy Instant Pot Hard Boiled Eggs cook in 15 minutes. They cook perfectly every time and are super easy to peel. Perfect for snacks or appetizers. Pour the water into the pot, and place the eggs on the rack that came with your pot, or in a steamer basket. Close the lid, press the Manual button on the Instant Pot and adjust to 5 minutes at high pressure. Let the pressure naturally release for an additional 5 minutes after the cooking cycle completes, and then do a quick pressure release. 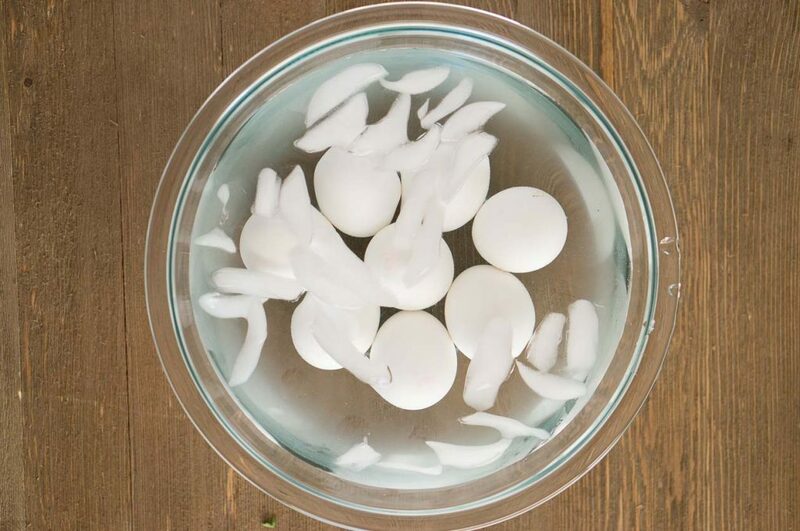 Place the hot eggs into cool ice water to stop the cooking process. Chill for 5 minutes before peeling. Peel the hard boiled eggs. 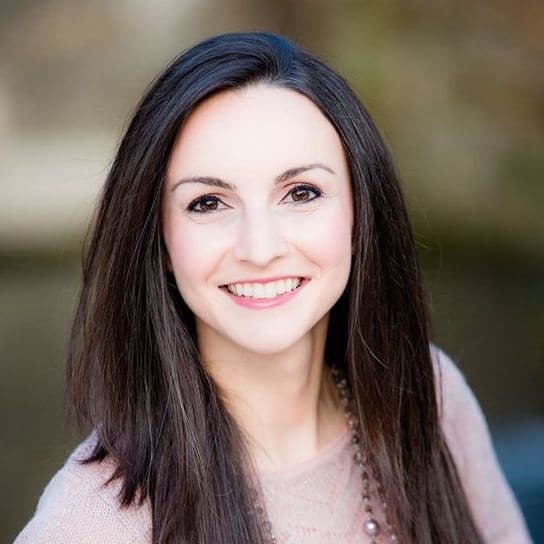 I’ve been sending my mom links to your instant pot recipes– she got one for Christmas and hasn’t used it yet! I keep telling her it’s so versatile — so the posts you are doing are great for new users. Wow, I’ll definitely share this with my friend. These were absolutely perfect! I had heard eggs cooked in a pressure cooker were easier to peel and that was definitely true. Thanks for sharing this technique. Yes, you can certainly make a dozen eggs. I haven’t tried with 12 eggs yet, but you can use 1 1/2 cup water instead of 1 cup. When I put in a dozen eggs at once, I had some shell breakage. Though we could still eat them, they looked bad. I’m making a dozen now, but am cooking six at a time. Make sure you add a cup of water to the pot. Perfect! Have tried for years and always hit and miss on too much or too little and shells not releasing from the egg. Did 2 dozen eggs and to be safe did them 6 at a time. They were done to perfection and came right away from the shell not losing any egg white or it looking like a cratered moon. Thanks. Another reason I love my instapot. I followed the 5-5-5 recipe for a dozen eggs and they were perfectly hard boiled and the amazingly easiest to peel I’ve EVER cooked!!! I honestly was amazed at how perfectly they were cooked and how easy the eggs peeled. They practically jumped out of the shell! I’d rate this a 10 star recipe if I could!